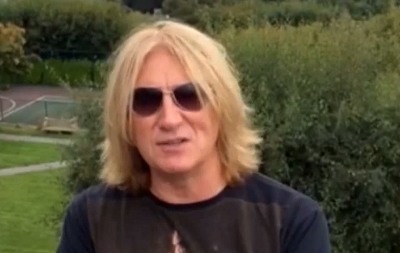 Def Leppard singer Joe Elliott appeared on the Ken Bruce show on BBC Radio 2 again today and mentioned more recording. Joe has been appearing as a guest all week on the show's Track Of My Years feature which was recorded back in December. After talking about the last two songs he picked, he went on to talk about Def Leppard's future plans including the cruise, the 2016 touring and plans to record more new songs at some point. Joe implies that this would be sooner than another seven year wait (we hope). Listen to the full show here and all the previous shows from this week. A full 48 minute version is also available. What's the story for Def Leppard at the moment? "We do this Hysteria On The High Seas where we're actually going out on a rock cruise. It starts off somewhere in Florida. Goes round one of the Caribbean Islands. Hopefully without a Cyclone ripping the boat in two. And then we've got three weeks worth of shows in February in the States. And then we're kind of open to offers if you like. We've got an impending American summer tour starting in June." "It's just onwards and upwards but I don't know where yet. You know we'll probably record some more as well because we really got into this new album. It was an accident that we couldn't wait to happen if you like. You know we went in the studio to try and write maybe two or three songs. We ended up with 14." The market is still there for good rock? "I believe so. I mean you know we were Top Five in the States first week of release. It was Number One in Japan. I mean the thing's going very well for us at the moment. More importantly than the sales. It's the response to the album has been very, very positive."